This is Ancient Classic of Por Tan Nam, and Immense Rarity from the Great Olden Days Khao Or Master Monk of Wat Don Sala, in Pattalung. and is a standard bearer amulet seen to be made by almost all Khao or Masters, which can be most famously denoted by the Pra Yord Khun Pol amulet of the Great Ajarn Chum Chai Kiree of the Dtamnak Dtak Sila Khao Or Southern Academy of Sorcery. The amulet is empowered with the Wicha Pra Yord Khun Pol, containing Invocations to summon the power of Kong Grapan Chadtri, Klaew Klaad, Maha Amnaj (commanding power and influence) and Serm Yos Status Promotion Magic. The front face of the amulet bears the Image of a Buddha setead in Mara Vichai Posture. The two Savaka, Magdalyayana and Saributra are standing either side, one holding a 'Chadtr' Parasol to shade the Buddha. 1. Hlang Yant Pu Dharavadi (Stupas Yantra - 1, 2 or 3 Stupas), 2. Hlang Yant Bai Po. 3. Oblong shaped Pra Yord Khun Pol 'Pim Badtiharn' (Miracle Pim) Hlang Yant Pu Dhavaradi, and 4. Pra Luang Por Tuad Pim Hlang Bai Po Amulet also released in the same edition, along with 5. Pra Pid Ta Nuea Takua Long Thom, leaden Nirodha Buddha amulet, which is also so Rare and famous, from Por Tan Nam. 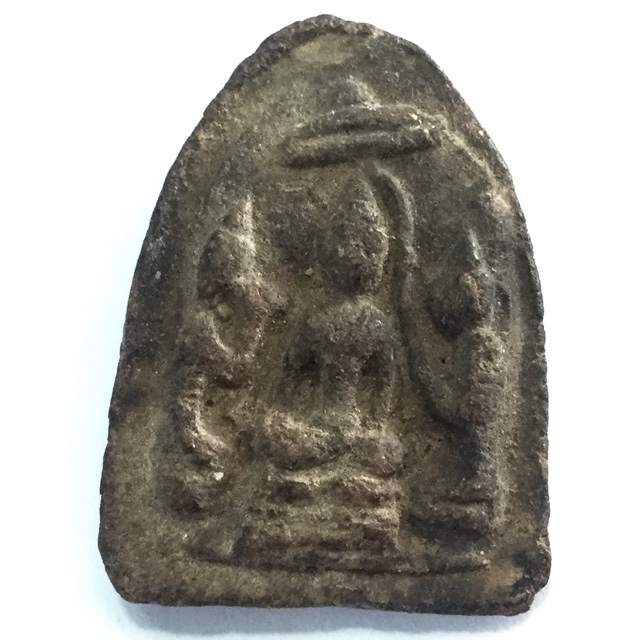 This Edition was one of Por Tan Nams Early Era Amulets, and a highly preferred Pra Niyom Classic. of national and International Historical Fame and Prestige. Powerful Kong Grapan Chadtri Klaew Klaad Protection and Evasion, Serm Yos Status Increaser Amulet of Legendary Proportion. His Role in the History and Legends of the Khao Or Magical tradition, and collaboration with the making of Amulets with this Grand and Large family of Sorceror Monks, who stem from a number of Famous temples within the Khao Or Tradition. His amulets are as sacred and rare as they are priceless, and are amongst the most esteemed and collected amulets of the High End 'Pra Niyom' Collector Category. The amulets of the 2510 - 2512 BE Era were made after Por Tan Nam's second and final Ordination, and are famous for their content of Ancient Sacred Earthen and Powder Amulets of many Great Olden Days Masters, and the Maha Wan Herbal Powders of Pra Ajarn Nam mixed with his Pong Tang Ha Samrej 5 Sacred Yantra Powders. In these times, Por Tan Nam still mixed bis own powders and made his own Yantra Inscriptions. Pra Yord Khun Pol is one of the Classic Historc Periodic Amulets which has its own 'Benjapakee' five regions set of 'Pra Niyom' preferred amulets, and is famed for its Serm Yos (Increase Status), Kong Grapan Chadtri, Klaew Klaad, and Maha Pokasap - Maha Lap powers. There are various forms seen in various regions who made the Yord Khun Pol amulet, with five of them becoming the most preferred, hence they also carry the name, 'Benja' (meaning 5) and 'Pakee' (Benjapakee). Use the Maha Namasakara (Namo Dtassa x 3), and Kata Aaaratana Pra Krueang to Bucha and beseech wish fulfilment from the Prakam Dee Kwai Yord Khun Pol. You can practice the Kata Aaraatanaa Pra Krueang, by using the tutorial in the below youtube video. Chant Maha Namasakara (Namo Tassa) Three times first, as usual before chanting to amulets. Chant once in the evenings for protection from danger and evil energies.